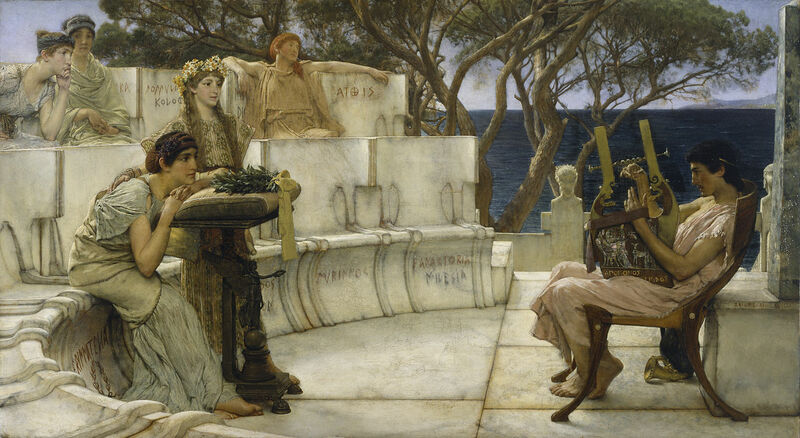 The ‘Natural City’ in the Republic: Is Plato Really a Libertarian? LATO believed that the ideal political situation would be a State with citizens neatly divided into Worker, Soldier, and Guardian classes living and working in harmony under the leadership of a philosopher-king, right? Actually there are good grounds to question whether this is what Plato really means in the Republic. Rather, Plato’s remarks in Republic 2.369b et seq. might be taken as his true view of the ideal political arrangement. There, before he mentions any other kind of government, he proposes a system that we might today call a natural law stateless society (or anarchy — but in the sense of having no government institutions, not social chaos). That is, Plato first proposes that if people were content with simple pleasures, they could live happily, in harmony with each other and with nature, and social affairs could be conducted without institutional government. In words that call to mind Hesiod’s myth of the Golden Age (Works and Days 109–142), Socrates here says of such a society, “They and their children will feast, drinking of the wine which they have made, wearing garlands on their heads, and hymning the praises of the gods, in happy converse with one another.” (Rep. 2.372b) He calls this first city the “true and healthy” State. He elaborates that governments become necessary only when people go beyond necessities and insist on luxuries: delicacies, courtesans, elaborate meals, fancy clothes, and the like (Rep. 2.373a). His interlocutor, Glaucon, insists that people will not accept such a simple way of life, which he deprecates as a “city of pigs.” Only then does Socrates agree to consider for the remainder of their conversation various forms of the “luxurious State,” which he also calls the fevered or inflamed State (2.372e). All the famous provisions of the ideal City-State in the Republic — the tripartite division of citizens into Worker, Soldier, and Guardian classes, for example — apply to this second-best State or second city. Then why, you may ask, does Plato spend so much time in the Republic talking about things like the three classes of citizens, training and education of the Guardians, philosopher-kings, etc. Possibly because all this pertains to Plato’s use of the Republic as an allegorical analysis of the human psyche, based on the principle of the city-soul analogy. In other words, this later discussion is primarily a psychological allegory — which is the main level at which the Republic is meant to be understood. However — and this is merely a possibility — perhaps Plato could not resist the opportunity to express his true political views briefly, and in an ironic and somewhat cryptic way. Certainly the pacifist themes at the end of these remarks (2.373d-e) would make sense for someone who, as Plato did, grew up during the Peloponnesian War — which was not only pointless to begin with, but resulted in humiliating defeat for Athens, a devastating plague, and massive social upheaval. But even so, we should also be prepared to interpret this as psychological allegory. Understood in that way, the second city may represent a well-governed soul in search of its lost homeland and its desired state of repose. But once the homeland is reached, happiness is maintained without such strong conscious attention to self-government. That is, one may reach a condition that is the psychic equivalent of Engels’ notion of the withering away of the state (i.e., a perfect utopian society). It might be objected that such a perfect condition is simply impossible — either for an individual or for society — because of imperfections in the nature of each. However in the case of an individual we could allow that such a state may potentially be experienced temporarily (as with a Maslowean peak experience), and, if so, may still be quite valuable for personality integrity and growth. Those familiar with Zen Buddhism might see a possible connection with this mental condition and the 10th image of the Oxherding Pictures (10. ‘Both Vanished’). having an eye to poverty or war. But, said Glaucon, interposing, you have not given them a relish to their meal. and they will roast myrtle-berries and acorns at the fire, drinking in moderation. And with such a diet they may be expected to live in peace and health to a good old age, and bequeath a similar life to their children after them. and dine off tables, and they should have sauces and sweets in the modern style. Yes, I said, now I understand: the question which you would have me consider is, not only how a State, but how a luxurious State is created; and possibly there is no harm in this for in such a State we shall be more likely to see how justice and injustice originate. In my opinion the true and healthy constitution of the State is the one which I have described. But if you wish also to see a State at fever-heat, I have no objection. For I suspect that many will not be satisfied with the simpler way of life. They will be for adding sofas, and tables, and other furniture; also dainties, and perfumes, and incense, and courtesans, and cakes, all these not of one sort only, but in every variety; we must go beyond the necessaries of which I was at first speaking, such as houses, and clothes, and shoes: the arts of the painter and the embroiderer will have to be set in motion, and gold and ivory and all sorts of materials must be procured. makers of divers kinds of articles, including women’s dresses. And we shall want more servants. Will not tutors be also in request, and nurses wet and dry, tirewomen and barbers, as well as confectioners and cooks; and swineherds, too, who were not needed and therefore had no place in the former edition of our State, but are needed now? They must not be forgotten: and there will be animals of many other kinds, if people eat them. and give themselves up to the unlimited accumulation of wealth? Then, without determining as yet whether war does good or harm, thus much we may affirm, that now we have discovered war to be derived from causes which are also the causes of almost all the evils in States, private as well as public. and this time the enlargement will be nothing short of a whole army, which will have to go out and fight with the invaders for all that we have, as well as for the things and persons whom we were describing above. Annas, Julia. The Inner City: Ethics Without Politics in the Republic. In: Julia Annas, Platonic Ethics, Old and New, Ithaca, 1999, pp. 72–95 (Ch. 4). Uebersax, John S. The Monomyth of Fall and Salvation. 2014. Uebersax, John S. Psychological Correspondences in Plato’s Republic. 2014. ANY know that the noble and estimable Thomas Taylor published the first English-language edition of Plato’s complete works in 1804. Although Taylor suffered poverty and obscurity in his day, his name will live on — if for no other reason than due to the influence of his work on English and American Transcendentalism. Thus, while John Stuart Mill and other British intellectuals severely criticized Taylor’s translations as, among other things, overly influenced by Neoplatonism, Ralph Waldo Emerson praised them. However the name of another translator, Harry Spens (c. 1714–1787; sometimes listed as Henry Spens), remains obscure to this day. Here we aim to set the record straight and give Spens due credit as the first to translate Plato’s Republic into English in 1763. The following are excerpts taken from the Introduction which Richard Garnett attached to his edition of Spens’ translation, reprinted several times from 1906 to 1922. 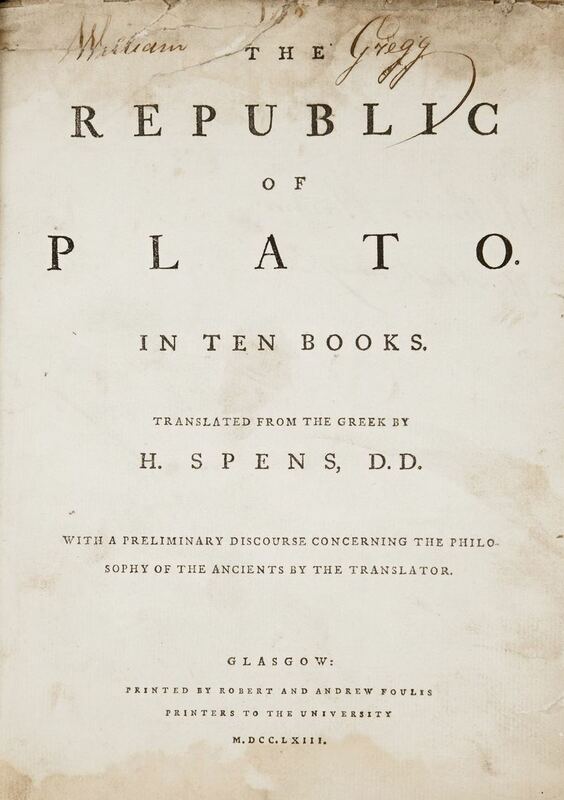 “That service to Plato … is no sure passport to immortality is evinced by the complete oblivion which has overtaken the translation of Plato’s Republic, by Dr. Harry Spens, although its priority to all other English translations, had it no other claim, should have kept it in remembrance. Published in 1763 at the Press of the University of Glasgow, by Foulis, the most eminent Scotch printer of the age, and dedicated to the Prime Minister, it appears to have attracted no notice from contemporaries, and has never been reprinted until now…. “Spens, it appears, was the son of James Spens, Writer to the Signet, and was born in 1713 or 1714 at Kirkton, Alves, Elginshire, where his father possessed a landed estate which had been in the family for generations, which he transmitted to his son. Spens was educated at King’s College and the University, Aberdeen, where he graduated M.A. in 1730. He was licensed to preach in 1738, was ordained minister of Wemyss, Fifeshire, in 1744, and received the degree of D.D. from the University of Aberdeen in 1761. In 1771 he married Anne Duncan. On December 29, 1779, he was installed Professor of Divinity in St. Mary’s College, University of St. Andrews, and on May 25, 1780, received the high distinction of being elected Moderator of the General Assembly of the Church of Scotland…. “On the whole, Spens’s version should not be lightly esteemed. It is clearly the work of a scholar and a man of considerable literary ability, who might have rivalled his successors if the standard of his age had been higher, and if he had possessed the apparatus criticus at their disposal. They had magnificent libraries at their command, which gave access to a mass of Platonic literature which did not exist in his day. His labours suffer much in comparison by the absence of the illuminating comment which imparts such zest to the versions of Davies  and of Jowett [1871, 1875, 1892]. This arises in great measure from their special attention to the needs of students, while Spens considers only the general reader, who, by a pleasing fiction, was supposed to be able to read Plato without note or comment. Was Davis was really unaware of the Spens version of 1743? In any case, just as Taylor had relied heavily on Spens’ earlier version, Davis often retained or made only slight changes to Taylor’s. No doubt Davis and Taylor made important substantive changes; but the fact remains that in both cases a considerable amount of material was recycled from the earlier translation. To give an example, the following shows the concluding paragraph of Republic (10.621c-d) in each version. The Oxford Dictionary of National Biography has an entry for Spens, but I am unfortunately unable to access it and cannot say how much information it contains. Concerning Taylor, while he was not the first to translate the Republic into English, his other accomplishments were great and many, and perhaps another time we shall be able to remark upon them. Axon, William E. A. Thomas Taylor, the Platonist. London, 1890. Davis, Henry. The Republic, Timaeus and Critias. London, 1849. Vol. 2 of Henry Cary, Henry Davis, George Burges, The Works of Plato, 6 vols. (Bohn’s Classical Library.) London, 1848–1854. Evans, Frank B., III. Platonic Scholarship in Eighteenth-Century England. Modern Philology, Vol. 41, No. 2 (Nov., 1943), pp. 103–110. Spens, Harry. The Republic of Plato. Glasgow: R. and A. Foulis, 1763. Reprinted several times by Richard Garnett (Ed. ), London, 1906–1922. Prometheus Trust. Thomas Taylor: The English Platonist. < http://www.prometheustrust.co.uk/html/thomas_taylor.html >. Accessed 26 January 2014. Taylor, Thomas; Sydenham, Floyer. The Works of Plato. 5 vols. Vol. 1. The First Alcibiades, The Republic. London, 1804.